I decided brink is the ideal work to sum up this week as we are right on the verge of the spring/summer season. The grass is finally turning green, my daffodils are about 4 inches high now, the weather is warming up nicely, the trees are covered in leaf buds that are about to burst open and we have only a week to wait until our first camping trip of the year. We are on the brink of beach days, bike rides and barbecues for dinner, I just wish it would all hurry up and start. 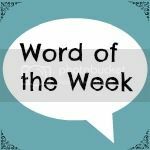 This entry was posted in Word Of The Week on May 8, 2014 by Lou. Blowin’ a hoolie here today, but have roses, alliums and euphorbia in bloom, everything growing like mad especially the weeds! It could all peak too soon and be over before summer starts! You’ll soon catch up. Oh, I’m so impatient too 🙂 We’re getting there though, at least the plants have all decided it is Spring now, even if the weather is still taking a little while to catch up!